← Namibia – a spiritual and humbling journey. 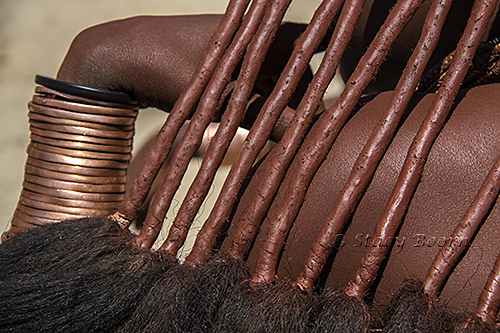 I could not live like the Himba people. 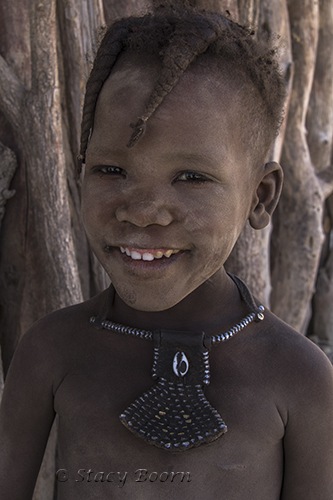 Their small, clan-based villages dot the harsh and barren lands of north western Namibia. For thousands of years they have been carrying on the same routine. In the morning the cows are milked, and then the men, goats and cattle go off to find grazing lands. Nomadic people, they sometimes occupy 10 different village sites in one year. As harsh as their lifestyle is and as unaffected by modern ideologies, they seem to be extremely peaceful and happy. Most Himba villages are small and made up of extended family units. When visiting such a village one must ask permission from the chief, but our afternoon visit found no chief on site so his three wives welcomed us. This was a real pleasure. We conversed through an interpreter we brought from the local town. The three women sat on the ground adorned in beautiful jewelry they had made. Their hair was in traditional format: covered with red dirt mixed with animal fats. This is the same mixture they use to bathe since the majority of time they have no access to water. 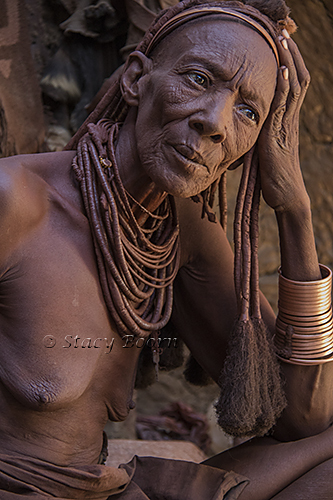 The Himba women were very concerned for us because we were mostly a party of women without spouses or children. They wondered how we could possibly survive without these helpers to take care of the daily tasks. After additional conversation they seemed more pleased than perplexed with our life choices. The day for women begins when they cover themselves with a mixture of red rock called ochre and butterfat from the animals. This makes their skin a deep red color. They put the same mixture on their hair, clothes and jewelry. The women are very proud of their traditional dress. It can take five or six hours to get the mud and adornments on their heads just right, so they sleep with their heads on a neck rest to make sure that all the work that they have done to beautify themselves does not get disheveled while sleeping. 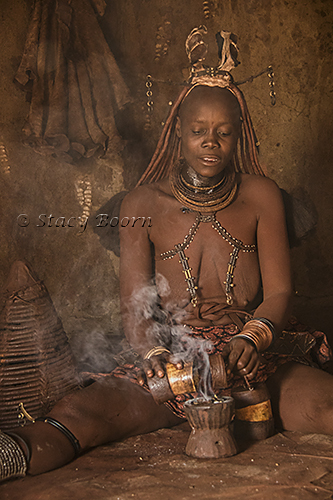 In one large round hut we witnessed how the women perfume themselves with bellowing incense. They explained who lives in the hut and how the family units worked. At age of three the children leave the parent’s hut to live with all the village children where they grow up playing and caring for one another. The children are raised by everyone in the village. Their hairstyles give away whether the child is a boy or girl – two braids down the front of the face indicate a girl. Himba villages are hubs of socialization since they love to talk and laugh. The women work together, but the pace of life is slow and easy, giving everyone time for conversation with one another and the occasional visitors. Before sundown the last of the chores is completed, the wood is collected for the fire. The head of the village is the oldest male member of the family groups. He is responsible for the religious organization of the village, the sacred acts, solving problems, overseeing life and the dispensing of justice. Because of their geographic isolation they have been unhindered by the influences of other civilizations. Though their traditions are under scrutiny and they feel the pressure of modernizing ideas and practices, they continue to live their nomadic existence, moving with their goats and cattle to places where they can find water and adequate grazing. One wonders what will become of Himba ways with climate changes and the influence of travelers and developers. Ancient traditional earth-based medicines have kept them healthy for centuries but now they are being impacted by diseases (i.e. AIDS) that were never part of their history, requiring different kinds of medications. One hopes that it is the Himba themselves who will be able to choose how their culture goes forward, what can be the same or what they desire to change. I don’t usually photograph people, but I love to take people-shots when I’m traveling, especially in places where I cannot speak the native language. My camera becomes a vehicle of communication. Photographing others is almost like a dance that we enter into – smiling and looking at one another and making gestures. With the group of Himba children I realized that not all hand signals are interpreted in the same way. I was trying to get them to look in a certain direction. I put my hand above my head hoping their eyes would go there, but instead they kept waving back at me. When permission is granted, and if it is done with respect and reverence, image-making is a way of honoring the other. I believe the world can be a better place when we learn to honor one another whether through the camera or in conversation. In so doing I know I am a better person. 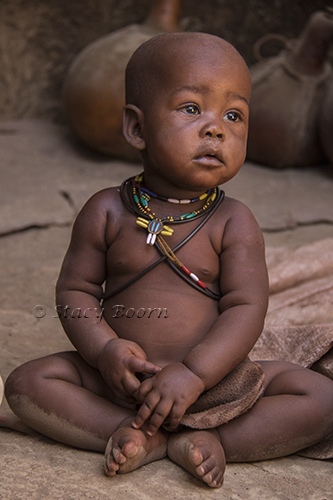 This entry was posted in Weekly 2 and tagged Himba, Himba Children, Himba Hair, Namibia. Bookmark the permalink.